The two older people on their bicycles on the right, will be able to cross the intersection faster than the two younger people going straight-on. That is what the new sign indicates here. But then again, those two youngsters may want to go left. Not everybody needs to go in the direction of the Railway Station. That there can even be a faster route across an intersection may need some explanation for someone who is not from the Netherlands. Because it means there must be more than one way to pass an intersection and that is indeed the case. You can get to the far corner of this junction via the right hand side and via the left hand side. But how can you know which will be the faster route? This has to do with the fact that in recent years you see more and more bi-directional cycleways in this country. Sometimes these two-way paths are on the left hand side of a road. At some point they may connect to older routes where there are one-way cycle paths on either side of the road. That leads to a very unfortunate situation at crossroads: to go straight-on you need to cross the road twice! So how can a road manager soften that big disadvantage? The city of ʼs-Hertogenbosch has done that by making the crossings bi-directional. That way you can choose how you would like to pass the intersection. Either the ‘standard’ way (first right and then left, so you pass the intersection along the right hand side), or you go straight first and then right. This means you cycle on the left-hand side of the intersection (‘against traffic’ as it were). Usually people chose which way they went by picking the first light that turned green. But you could never predict if you maybe had to wait longer for the second light in your second part of the crossing. To end that uncertainty, this new sign indicates which of the two ways is the fastest, including that second crossing. The route in this particular case is the final part of the F59 high-speed cycle route that is under construction. In ʼs-Hertogenbosch it takes you to the central station. Most of the high-speed cycle route is away from motor traffic so you can really cycle at speed without interference of that motor traffic. But close to the central station there is this one big intersection with traffic lights, which kind of ruins that image of a fast route. However, this innovative new sign indicates which way around the intersection is the fastest way and that brings back the idea that this really is a fast cycle route. My video to explain how the new dynamic traffic sign makes sense in this Dutch traffic situation. As you can see in the video, people immediately adjust their route with this information. They either go straight and then right, or right and then left. Even when the lights are both red, you now know that when you follow the arrow, you will arrive at the far end of the intersection in the quickest possible way. The sign the city chose to represent the Railway Station (top right) may be a bit strange if you are not familiar with this typical 1970s Dutch Intercity train. 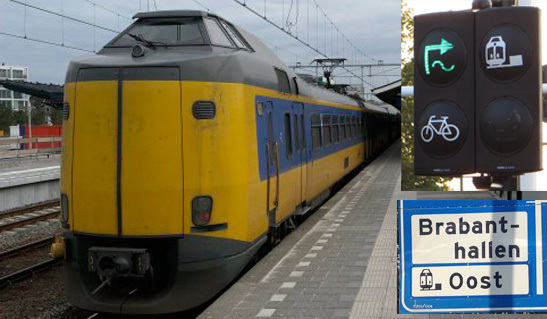 That type of train is used on more signs (bottom right), so to most Dutch people it is clear what the picture represents. The little wave with the arrow represents the ‘green wave’ that you get when you follow the arrow. 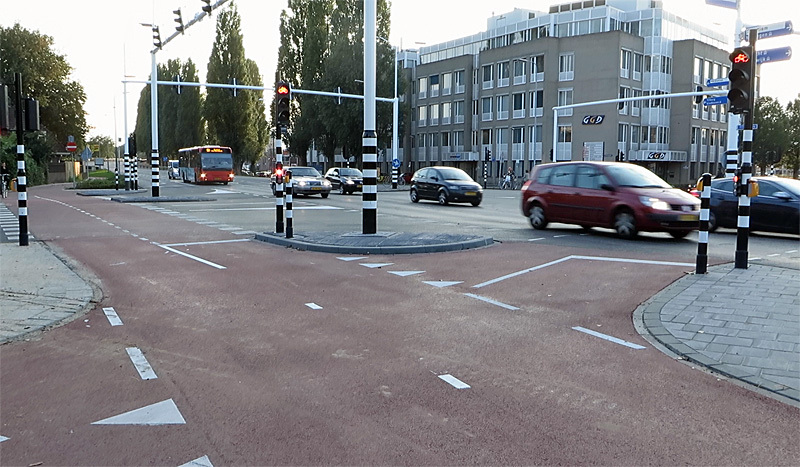 When I asked the city’s traffic engineer Arnold Bongers to tell me more about this novel feature, he said: “This is something we developed ourselves and we think this is a first in The Netherlands. We have our own in-house expert technician for our traffic light installations. This expert technician, my colleague Eric Greweldinger, did a great job in implementing the idea to inform cyclists like this, in the new traffic light installation at this intersection. The whole feature was created for an extra amount of €23,000. For that sum we realised the dynamic sign with detection loops and a detection camera. Modern digital methods offer a lot of possibilities, but who gets green and when is primarily a choice, laid down in the traffic policies. We try to optimise the green times by looking for the limits within the safety boundaries. I think people cycling in ʼs-Hertogenbosch should be able to notice this by now. For the moment this is a one time experiment. A spokesperson for the municipality has been quoted as follows: “At this time there are no plans for more of these ‘dynamic’ traffic signs for people cycling.” Which is a pity, because there are several other locations in the city where a two-way cycle route on one side of the street continues as two one-way cycle routes on either side of the street. At least here it saves people cycling some time in an innovative way that is at the same time simple and quickly and easily understood. Key features of good infrastructure! On Twitter there was a comment about the size of the road here, which was considered too wide, not needing a dual carriageway here. This situation might have historical roots: In the 1950s and 1960s this road was part of one of the main car routes in the Netherlands, the National Route 2 Amsterdam-Utrecht-Eindhoven-Maastricht. In 1970 this changed, because this part of the route was changed to a freeway, going around the city of ‘s-Hertogenbosch. Since then, this has been a major route into town, and apparently was not narrowed for this piece of the route (although it was in most other places). But this is to change: Currently a new road is being built on the other side of the railway. It will take over the main role of this road, which will then undoubtedly be downgraded – and narrowed. There was even talk about making the bridge south of this place car-free (only for buses and bicycles), but that did not even nearly get a majority in the city council. A map about this new road being built that I made to comment on another of Mark’s postings is on http://tinypic.com/view.php?pic=14y6g77&s=8. Red is the existing route, blue the new route, yellow a planned future extension of the new route. This intersection is at the location of the upper of the two green dots. Whereas in UK, they are still ‘consulting’ on *whether* London will have 1 bi-directional cycleway, on 1 side of the road, that won’t even be full width, or with full segregation along its whole run. This is laughably called a ‘SuperHighway’ in a city of millions. And so far, only 2 will be ‘upgraded’ like this! Anyway, cheers from “dodge the traffic” London, Mike. I find with people who are inexperienced with cycling and don’t know about “vehicular cycling” where to make a left turn you get in the left lane and signal and all that behaving like a car stuff, they often tend to make a left turn by going left on the crosswalk then across on the next crosswalk and from there continue down the street. That movement is exactly how this intersection is set up to do. Interesting. The symbol to my eyes seems like it has something to do with alternating current or with approximations. But if the tilde-like symbol has already been established for the green wave then it builds on what folks already know. Why is there more and more bi-directional cycleway installations in the Netherlands and yet Denmark removed this as best practice over two decades ago according to this article. Is the difference in how the two countries approach this due to the Netherlands having greater control of the movement and separation of motorists and cyclists at the intersections compared to Denmark or is it perhaps lack of space as the above article infers? An important point is the degree of separation. The article discusses mostly situations where the situation is just some paint, and in Denmark the situation is usual to have just a kerb or similar height difference as separation. In the Netherlands, at least where 2-way cycle tracks are usual, there is a separation of considerable width – at least one meter of grass, shrubbery or similar. And the separation is even larger where a sideroad is to be crossed. Because of this, the cycleway feels more like a separate road that happens to run parallel than like a part of the road set apart for cyclists. Another, but more minor, issue is what one is used to. The main disadvantage (when there is sufficient separation so there is no encroachment between bicycles and cars) is that drivers coming from side roads are not prepared to have nearby crossing traffic from the left. Partly this is solved by the separation itself, by making the crossing feel more like two separate crossings. But also partly, Dutch drivers by now are used to this situation and will take it into account, whereas Danish drivers are not. As André already explained, the situation in The Netherlands and Copenhagen is very different, almost to the point that you cannot compare the two. The Dutch have indeed separated and unbundled their types of traffic much more than the Danish. The article you mention is against two-way paths on one side of a (busy) city street. The Dutch don’t build them there either. As you already seem to understand, the main arterials in The Netherlands can no longer be found in such city streets in most cities. The main flow of traffic has already been diverted to streets and roads that were designed specifically for a main flow of traffic. So in this country two-way cycle routes can be a good solution. In many situations, bi-directional cycle paths are considered to be best practice. Of course it all depends on the context (environment) and the way the cycle track is designed. In cases where a large group of cyclist would prefer one side of the road over another, for example to prevent having to cross the road multiple times, a bi-directional cyclepath would be prefered. Most cyclist will choose to ride against traffic in such a case anyways. Crossings of sideways with bi-directional cycle paths next to roadways are often considered to be somewhat less safe with single-directional ones. 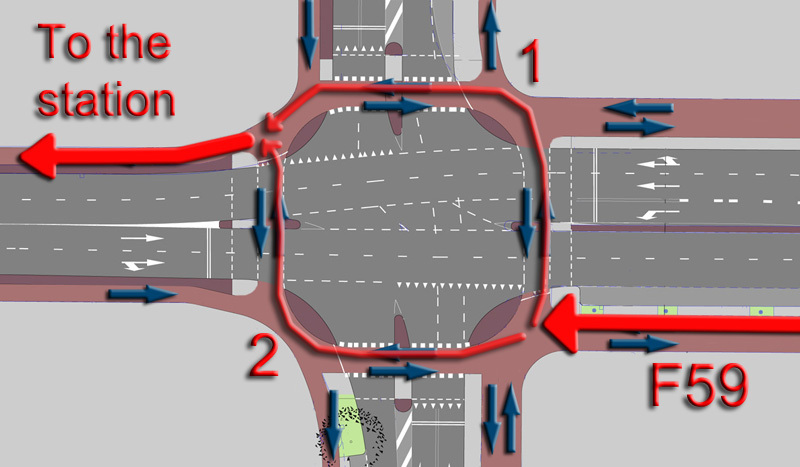 However, in stead of just ruling them out because of that reason, there will be extra focus on how to design the crossing in such a way that the potential risks are reduced to a minimum (of which some are described by andereengels). There’s still another advantage of this system. When I take the route ‘over right’ (I haven’t had a case yet where I went ‘over left’), I found that it’s easy to cut off the corner between the two crossings, because that part of the crossing will be empty anyway. I don’t really understand the function of the detectors. Does the presence of a bike actually alter the traffic cycle? Or is it just about getting the bicycle rider’s attention by only displaying when they approach? Or something else? 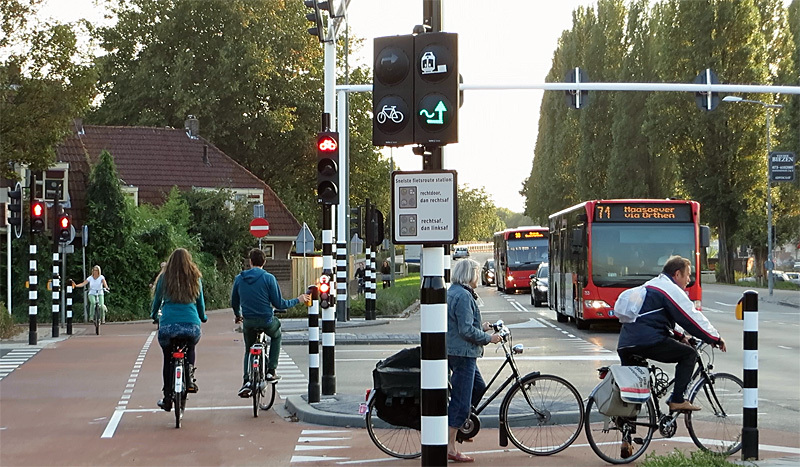 The presence of any traffic always alters the cycles at modern Dutch junctions. They are (almost) always demand driven. So you don’t have to wait for non-existent traffic at night for instance. So yes it does alter the cycles and it also draws attention when the light flashes on. This entry was posted on 9 October 2014 by Bicycle Dutch in Original posts and tagged ’s-Hertogenbosch (Den Bosch), innovation, junction design, traffic lights.